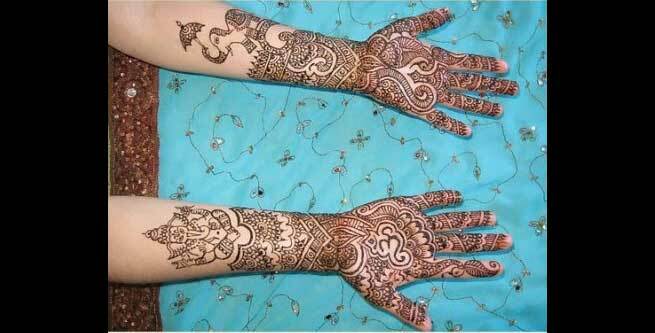 20 Best Indian Mehendi Design Ideas To Try Now! India is a melting pot of cultures. It is known for maintaining a sense of unity despite its diversity. This is reflected perfectly in the henna design patterns of India. 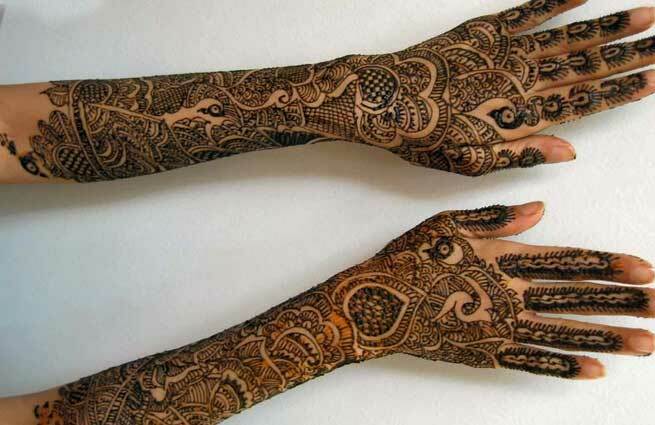 Henna is considered an emblem of good fortune in almost all parts of India, but its patterns are unique to each culture. The huge variety of Indian mehendi design styles motivated us to create an article comprising the finest henna patterns across the nation. 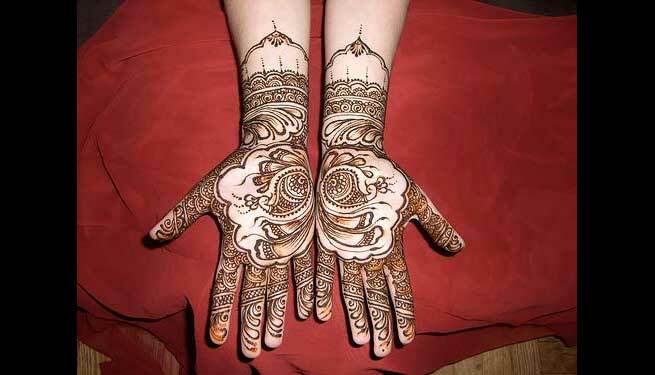 Mehendi, also known as henna, is a form of body art from ancient India. The powdered dry leaves of Lawsonia inermis, the henna plant, are used to make a paste. This paste is then used to draw decorative designs on a person’s body, usually on the arms and feet. Once the paste dries up, it is washed off and leaves an orange-red pigmentation behind. The color fades away naturally after about two months. 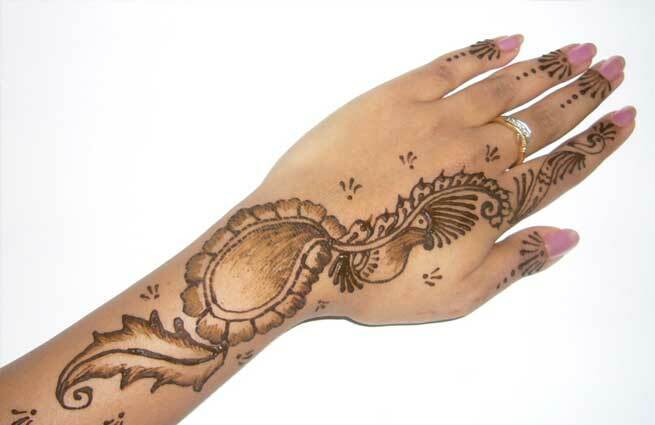 Hence, henna is also referred to as a type of temporary tattoo. 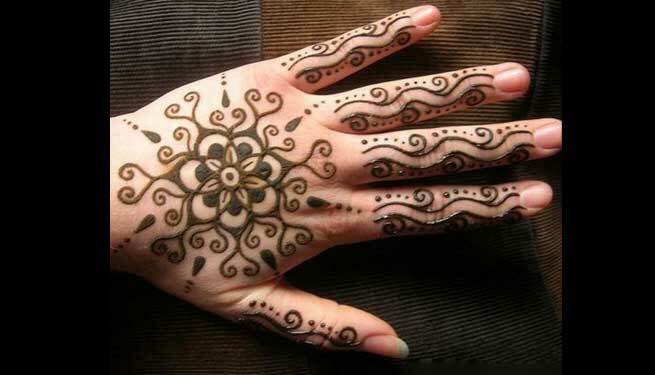 Here is a compilation of the top 20 henna designs we think everyone should try. Check them out below. 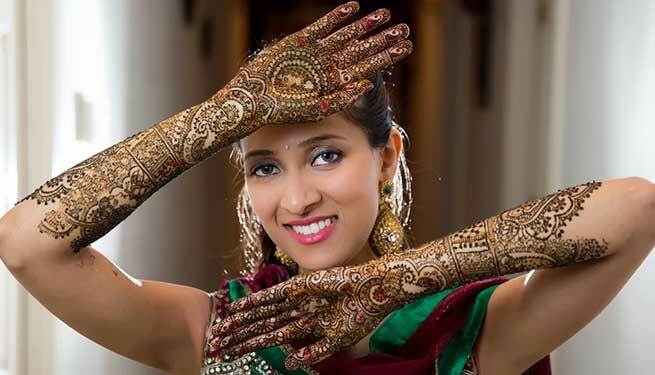 An Indian bride often stands out with her hands and feet full of intricate henna patterns. 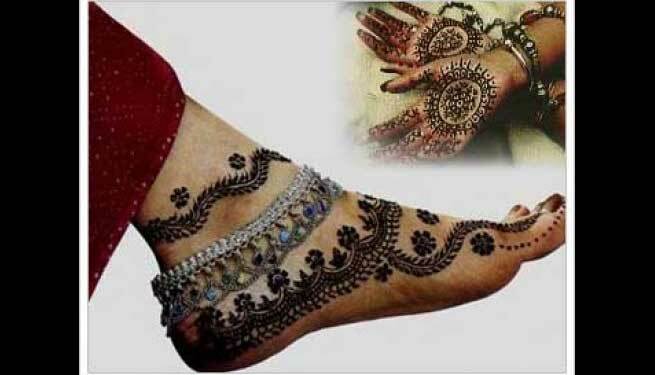 This bridal mehendi pattern is made with a Marwari style, commonly known as a “dulha-dulhan” henna design. It features caricatures of a bride and groom. Music and mehendi – these two are the soul of a grand Indian wedding. In fact, we often don’t hesitate to show our music fervor through mehendi designs, too. This picture features a pair of tablas, an Indian percussion instrument, in the lower part of the palm. The mindful game of chess originated in India hundreds of years ago. From India, the game spread to Persia, and to the rest of the world from there. In this pattern, we see a beautiful fusion of Indian and Persian art. The black and white chess blocks represent India, and they are creatively woven inside the Persian paisley motif. 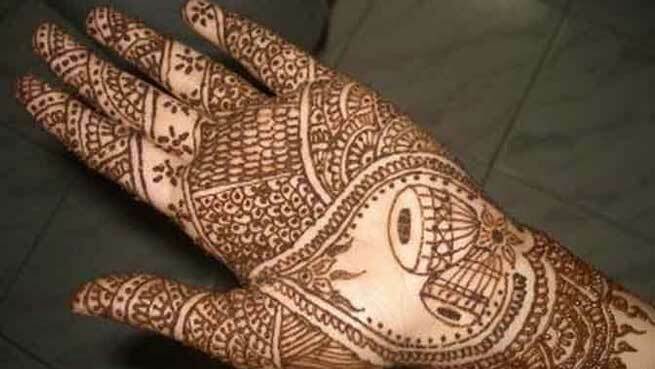 Similar to Arabic henna patterns, Indians also include vines in their mehendi designs. However, the Indian patterns are further complemented by various intricate fillers. 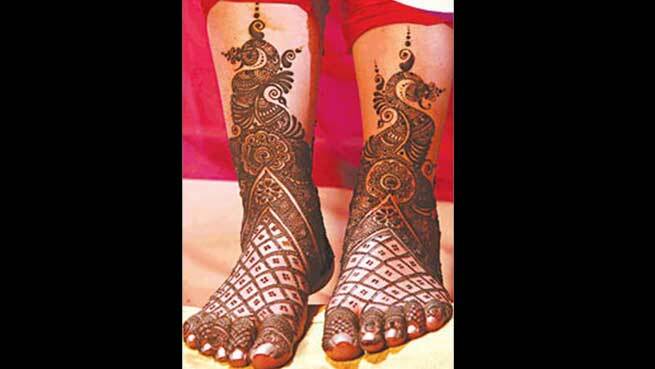 Take a look at this detailed henna feet design, showcasing pretty vine-like motifs towards the top. The betel leaf motif is perhaps the most popular mehendi design pattern in India. This bridal henna photo contains a lovely twist to the standard betel leaf motif, offering a glimpse of more traditional Indian mehendi designing. 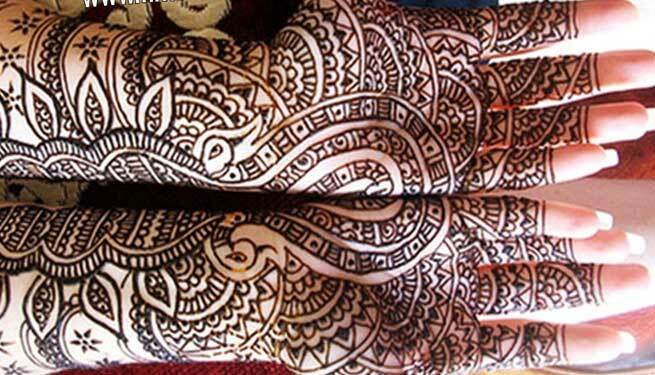 This gorgeous mehendi design is a wonderful example of a Rajasthani henna pattern. It features peacock motifs and various geometrical shapes, which are often found in Rajasthani jewels too. This photo features India’s famous mango motif with an Arabian flavor! Here, it is portrayed in an exquisite Mediterranean vine shape. 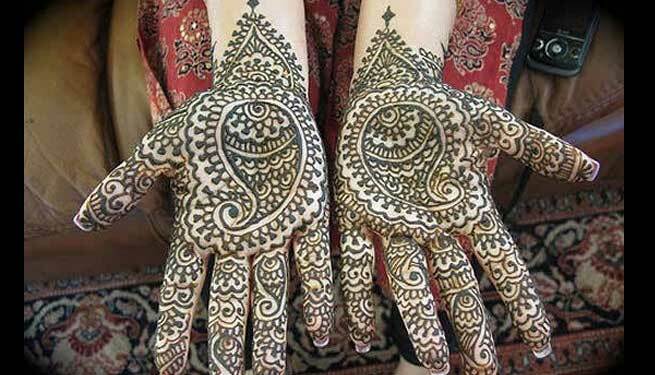 This is a beautiful example of Marwari mehendi art, in which one hand’s henna pattern perfectly complements the other hand’s henna pattern to create a single, unified design. Here, we can see two detailed halves of a heart pictured together, symbolic of true love. 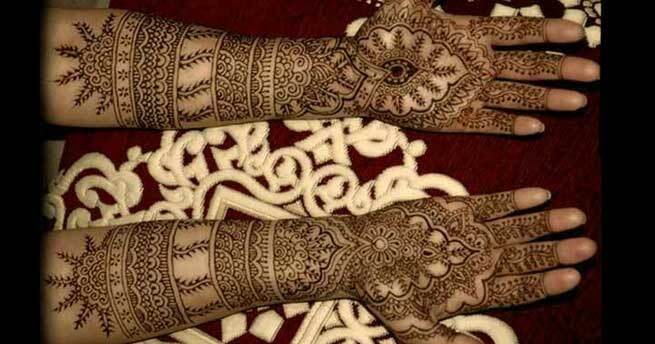 Indian mehendi vine patterns are quite different from those of Arabian origin. In this picture, you can appreciate a foot adorned with traditional Indian plant creeper henna patterns that wrap around the ankles. 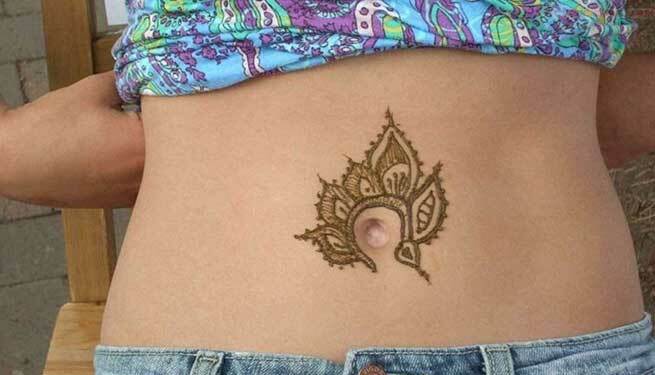 Indian henna patterns are unique and it has the ability to look pretty on just about every inch of your body. This lovely design crafted around the belly button is a more modern design, perfect for lehenga or ghagra wearers. India is home to a plethora of traditional designs. This creative henna pattern displays an adorable mix of Rajasthani and Gujarati patterns with a touch of modern henna styling. 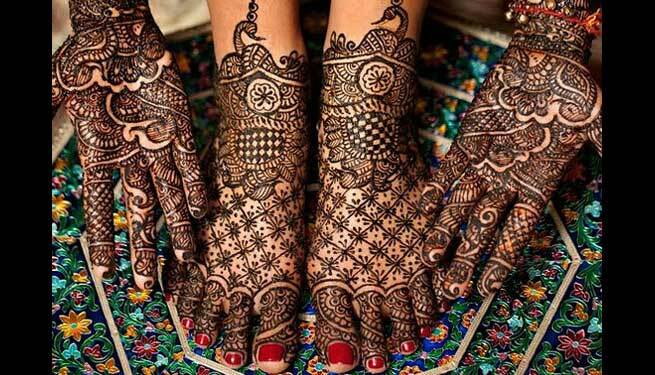 Indian brides make a distinctive appearance with their hands and feet full of complex henna patterns. When henna is your heritage’s unique attraction, you might as well go full out with it! This detailed design really defines a true Indian bride. When you are not part of or attending a huge festival, you might not want your hands immersed in exquisite mehendi patterns. In such cases, a simple design can keep you feeling elegant, without seeming over-the-top. Here is a typical Indian flower and leaf pattern – simple and sweet for all occasions. 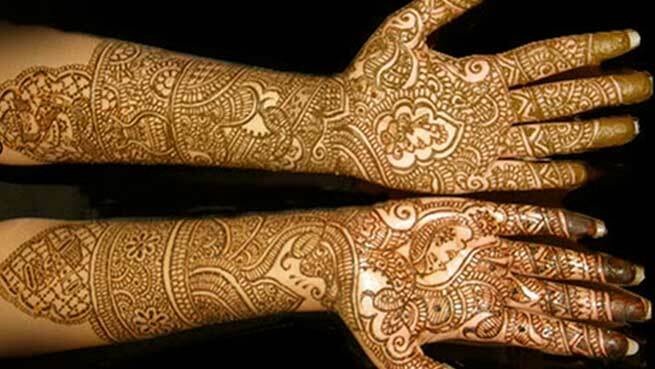 In recent times, the dawn of sparkling henna patterns has surfaced. When glitter is mixed with a traditional Indian mehendi design, it creates a truly dazzling modern mehendi pattern, like the one below. 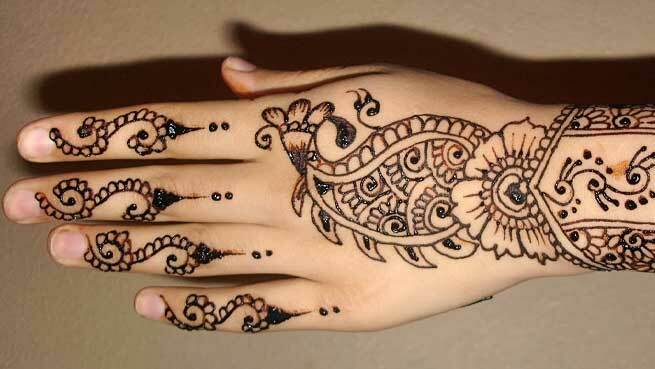 How does the idea of sporting a Rangoli design on the back of your hand sound? It’s easy, creative, original, and looks trendy too! This exquisite Gujarati mehendi pattern has unique peacock motifs, featured in a complementary fashion. Stunning, right? This Indian mehendi design has a big flower, blocks, and motifs – all of which, are woven together intricately. 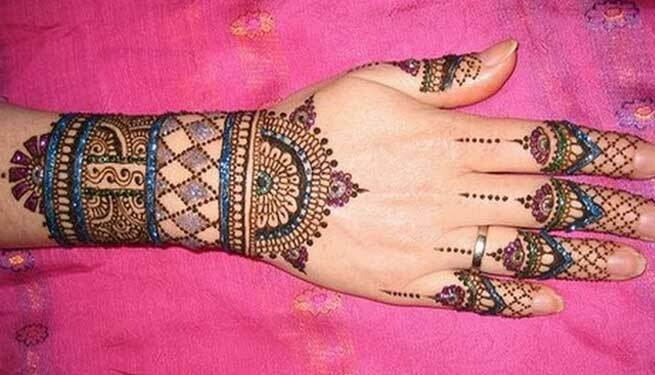 This bangle or kangan style mehendi design is a very popular Indian henna art pattern. This particular artist took the authentic pattern one step further by including glitter to give it a modern touch. In India, the majority of the female population takes fashion inspiration from Bollywood. 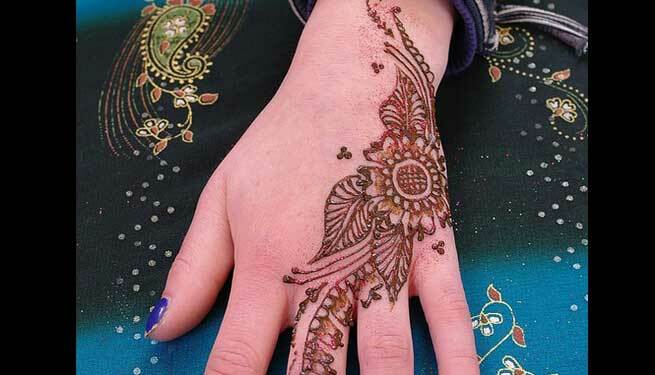 They also tend to opt for henna designs showcased by actresses in famous movies. This one is a good example. Religion holds an important place in this nation. In fact, it is often portrayed through various Indian art forms. 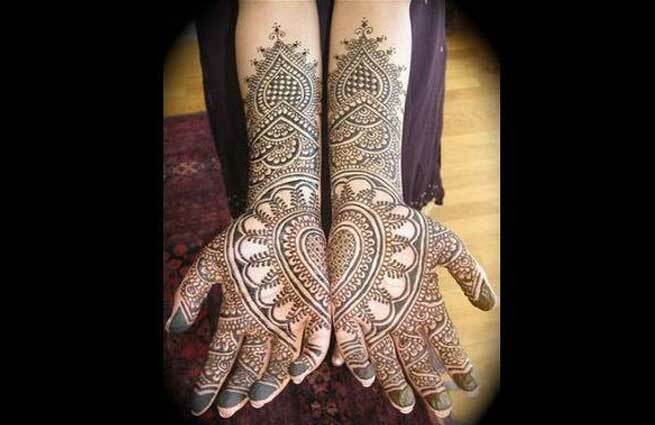 In many mehendi designs, religious symbols like the Om and Ganesha in this example, are displayed on the arms and hands, but avoided on the feet. 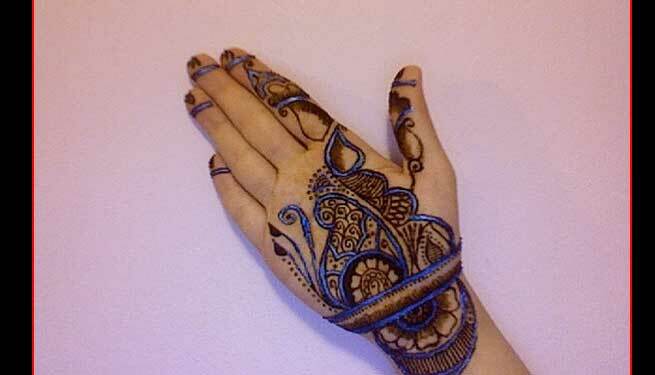 So, do try one (or more) of these henna designs out the next time you have a mehendi party!